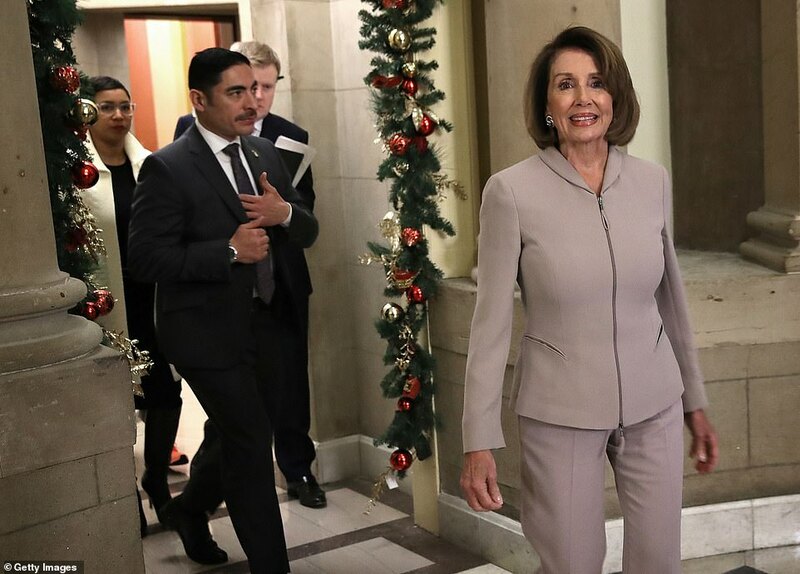 House Democrats have approved a plan to re-open the government without funding President Donald Trump’s promised wall, after newly-installed Speaker Nancy Pelosi joked she would allow him one dollar for his border barrier. The Democratic package to end the shutdown includes a bill to temporarily fund the Department of Homeland Security at current levels through February 8 as bipartisan talks continue. It was approved, 239-192. Democrats also approved, 241-190, a separate measure funding the Agriculture, Interior and other departments through September 30. The homeland security bill is virtually identical to a plan the Senate adopted by voice vote last month. The GOP-controlled House rejected the plan the next day, forcing a partial shutdown. Pelosi said Thursday night she would allow Trump one dollar for his border wall if it would reopen the government. ‘One dollar. Yeah one dollar,’ she joked on day 13 of the partial government shutdown. But, as she prepares to join other Congressional leaders at the White House Friday morning for another round of negotiations, she made it clear Trump’s wall is off the table. ‘We’re not doing the wall. Does anybody have any doubt? We’re not doing the wall,’ she told reporters in the Capitol. 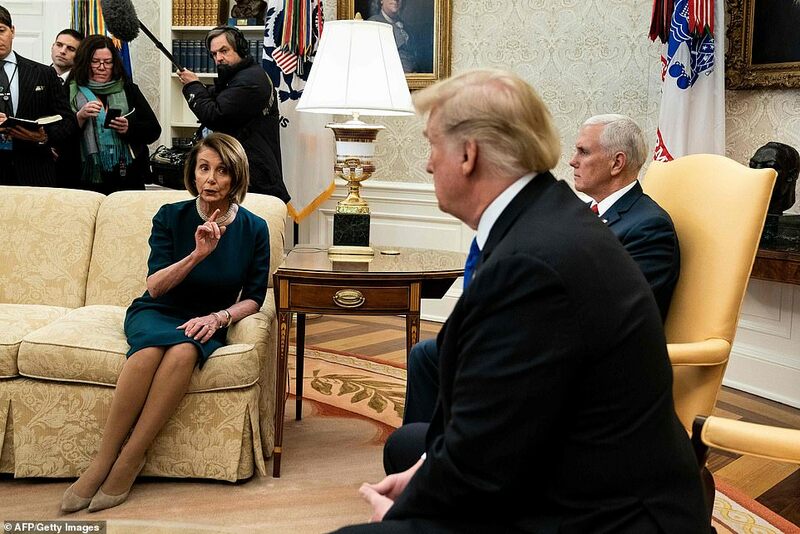 Pelosi made her stance from her new position of power – a few hours after Democrats took control of the House and she returned to the speaker’s chair. 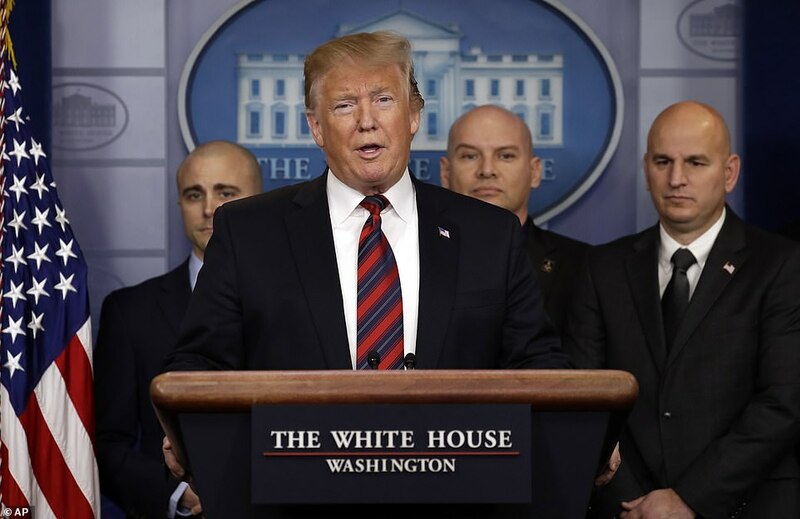 Her tough talked followed Trump’s, who made a surprise appearance in the White House briefing room Thursday to tout the need for his wall. She also drew a line in the sand with Republicans ahead of a House vote on a two-part plan from Democrats that would fund the Department of Homeland Security until Feb. 8 and fund all other closed departments – such as Justice, Interior, Transportation, Commerce and Agriculture – for the rest of the fiscal year through Sept. 30. ‘What we’re asking Republicans to do is take yes for an answer. We’re sending them back word for word what they passed,’ she said of the Democrats’ plan to reopen the government. ‘The president cannot hold public employees hostage because he wants to have a wall that effective – not effective in terms of its purpose and not cost effective,’ she said. ‘It’s a wall between reality and his constituents,’ she noted. 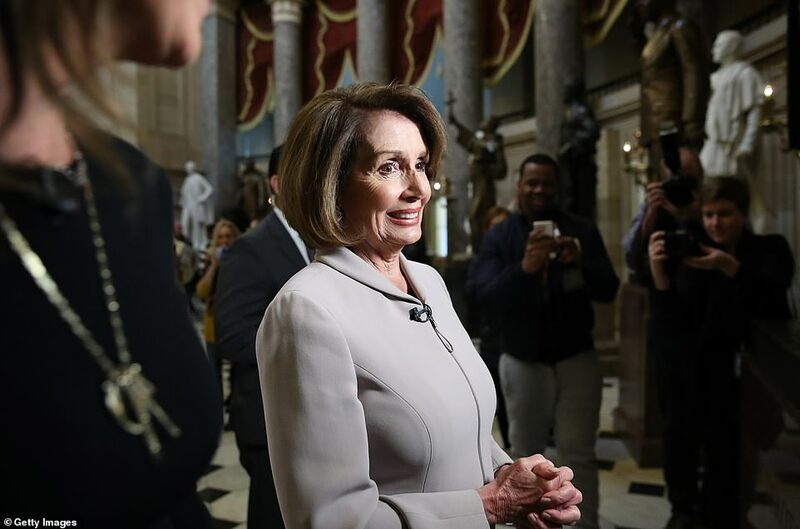 Pelosi returned to power on Thursday and marked a new chapter in Trump’s tenure in Washington as he faces a Democratic Party on a collusion course with his administration. 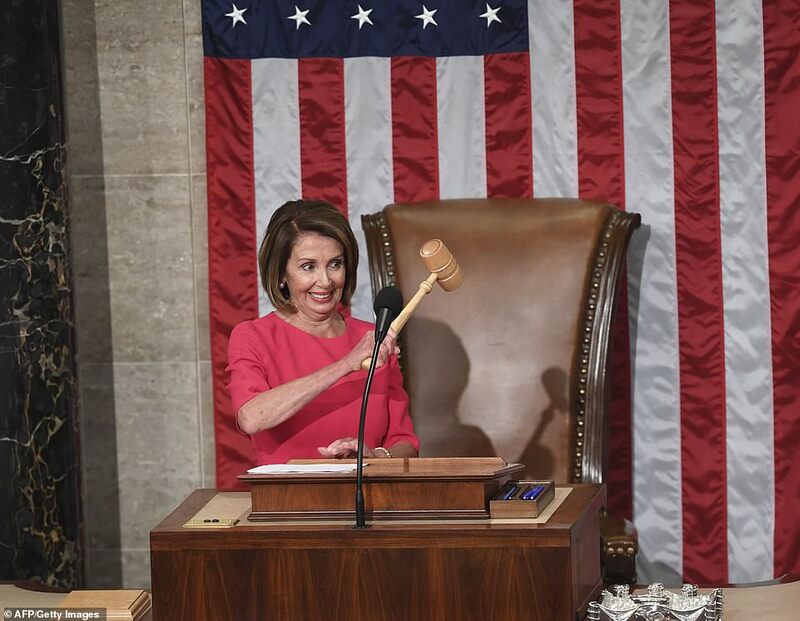 Grinning broadly and holding up the speaker’s gavel, Pelosi leads a party with power to subpoena Trump officials, investigate him, and block his legislative agenda. She did not mention Trump by name but she called for civility among the parties as they disagree and ask for the truth to be respected – a subtle dig at a president who is accused of name calling and lying about his record. ‘Let each of us pledge that when we disagree, we will respect each other and we will respect the truth,’ Pelosi said. ‘Transparency will be the order of the day,’ she added. She also didn’t mention the partial government shutdown that clouded her ascension to power. Democrats and the White House are at an impasse over funding Trump’s $5 billion border wall. Trump has made it clear he won’t sign any legislation to reopen the government without full funding for his wall. Democrats have made it clear they won’t give more than the $1.3 billion they’ve allocated for border security. The president and congressional leaders will reconvene Friday at 11:30 a.m. at the White House after a meeting on Wednesday made zero progress. 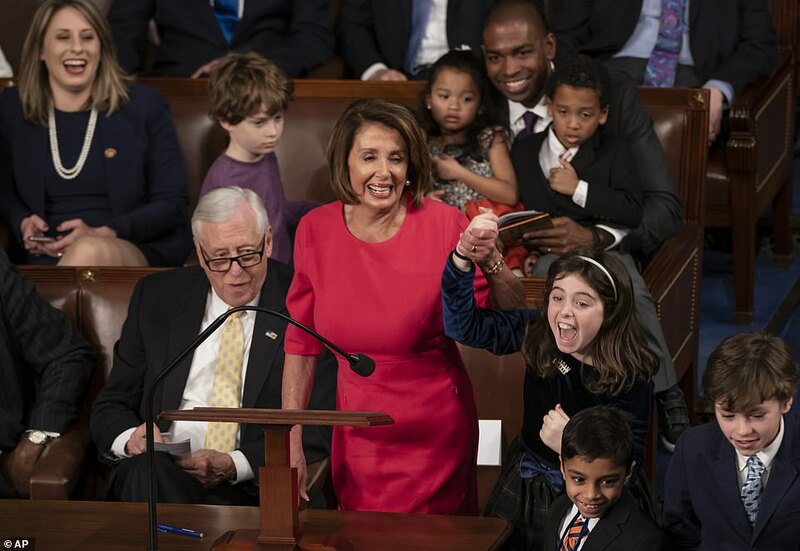 The wall got no mention in Pelosi’s remarks on the House floor but she did talk about an issue important to Democrats – protecting the children brought to the U.S. illegally by their parents. ‘And we will make America more American by protecting our patriotic, courageous Dreamers!,’ she said. 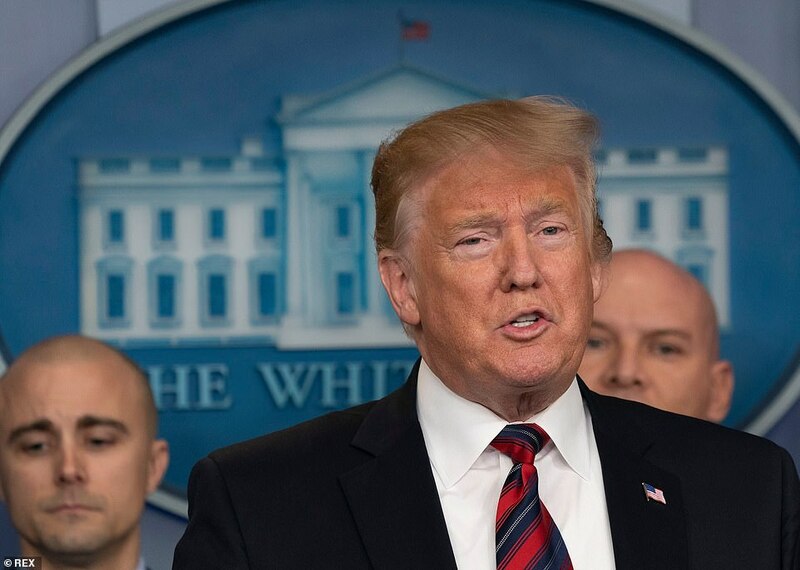 Trump started his seven-minute appearance in the White House press room with his congratulations to Pelosi. 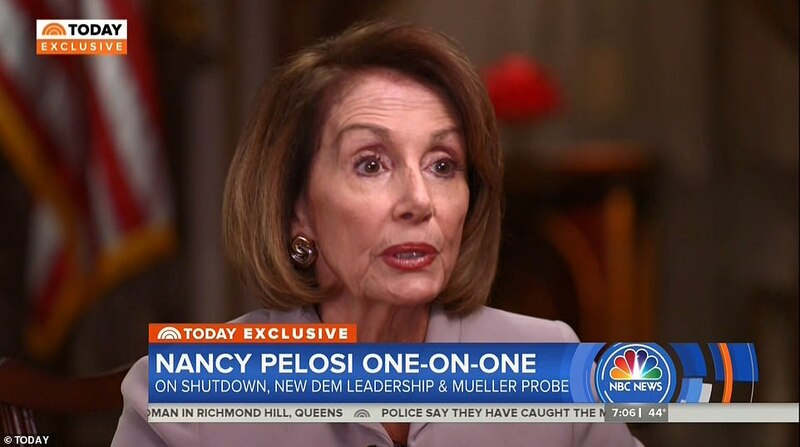 ‘I just want to start off by congratulating Nancy Pelosi on being elected speaker of the House. It’s a very, very great achievement, and hopefully we’re going to work together and we’re going to get lots of things done, like infrastructure and so much more. I know they want to do that very badly. So do I. So hopefully we’re going to have a lot of things that we can get done together, and I think it’s actually going to work out. I think it will be a little bit different than a lot of people are thinking. So I congratulate Nancy. Tremendous, tremendous achievement,’ he said. Then he let immigration officers talk about the importance of a border wall. He took no questions. 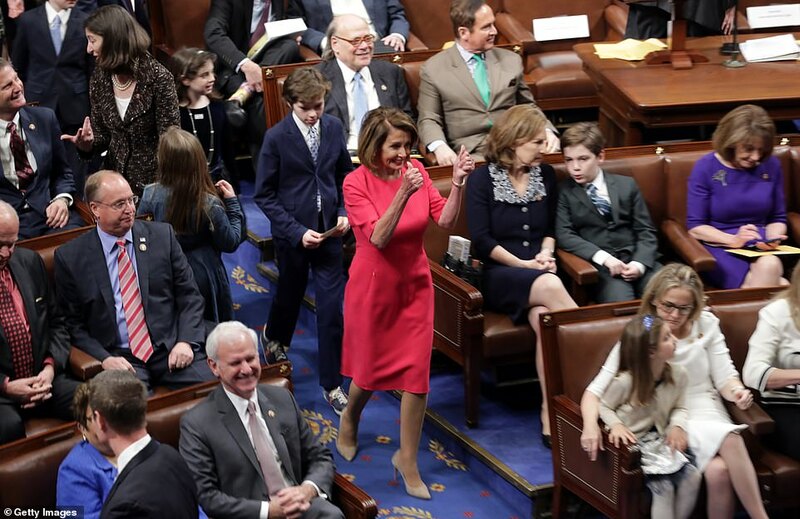 Pelosi invited her grandchildren and the children of any other lawmaker to join her at the dais when she took the oath of office. About 50 kids ran the podium to join her as Republican Rep. Don Young, the dean of the House, administered the oath of office. 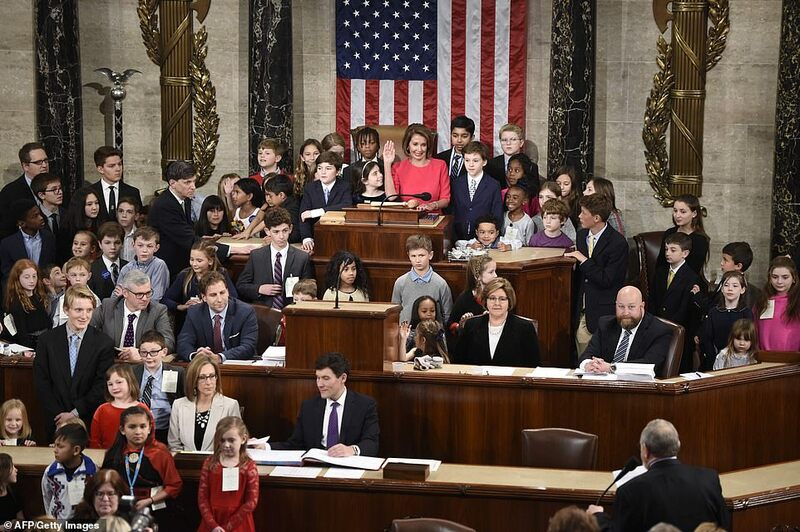 ‘I now call the House to order on behalf on all of America’s children,’ Pelosi said after she was sworn in as speaker. 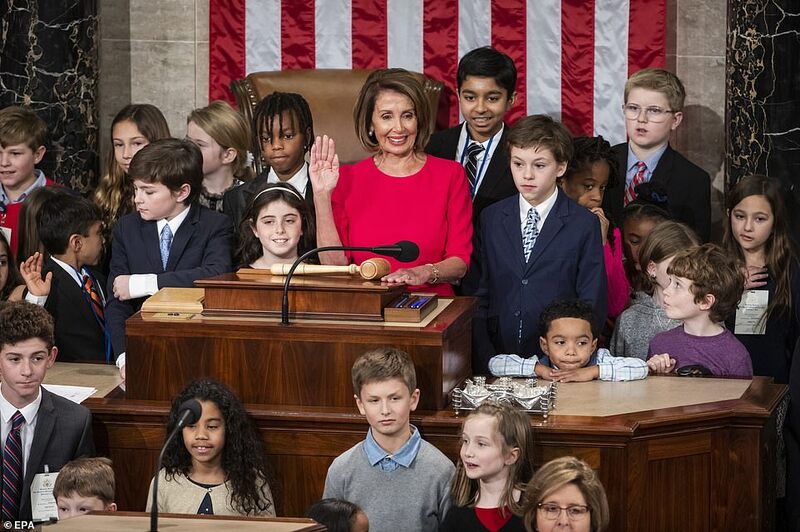 She then offered to let the children return to the parents before she administered the oath of office to the rest of the House. ‘No,’ she laughed when the parents rejected her offer. 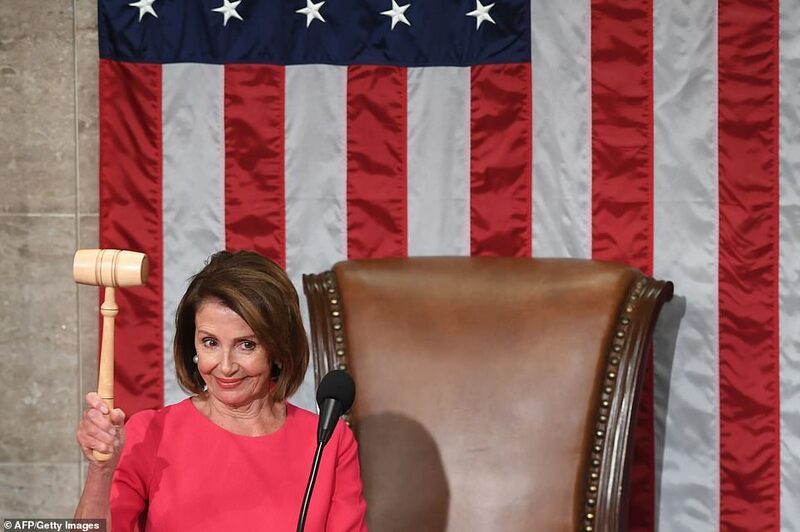 Pelosi was officially elected Speaker of the House in a roll that vote that saw the woman who became the first speaker in 2007 ascend to the job again. 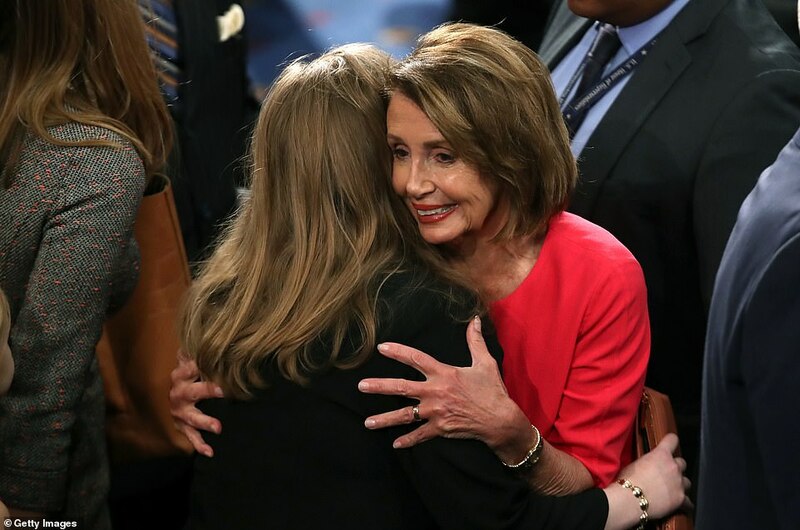 ‘I am particularly proud to be the woman Speaker of the House of this Congress, which marks 100 years of women winning the right to vote, as we serve with more than 100 women in the House of Representatives – the highest number in history,’ Pelosi said. 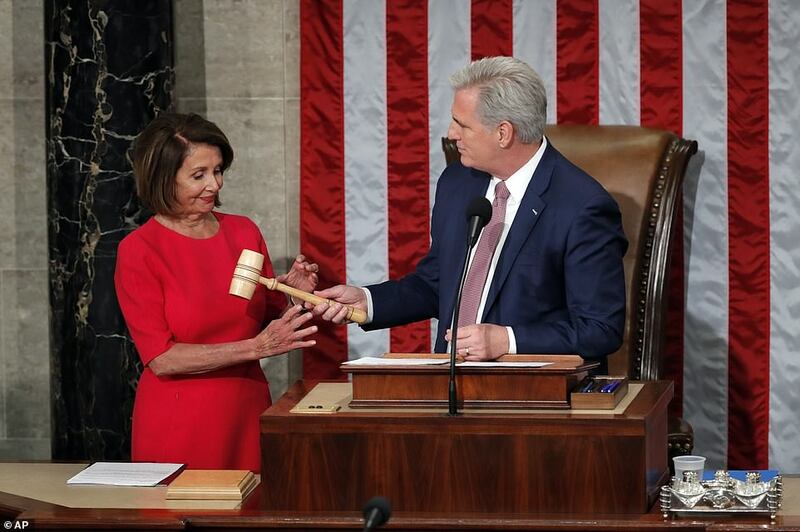 House Republican leader Kevin McCarthy handed her the gavel, marking the end of eight years of GOP power in the House. 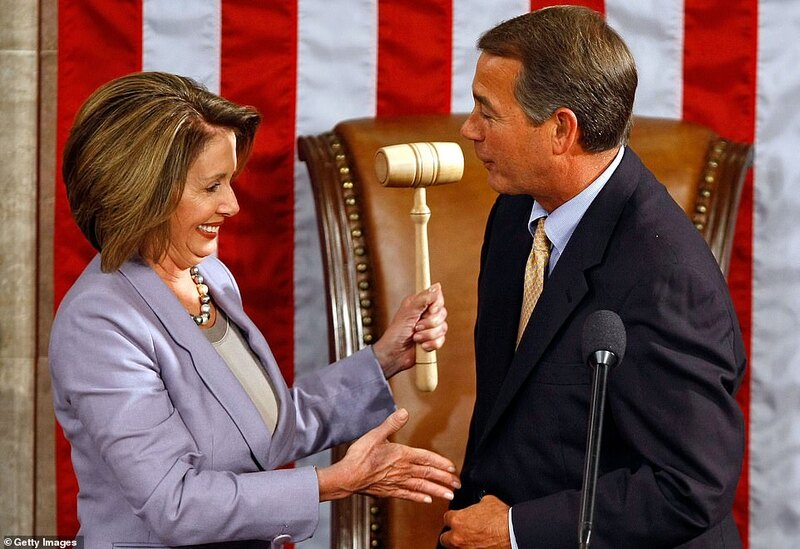 After being formally elected, Pelosi strode down the House aisle in triumph to take the gavel from Republicans. 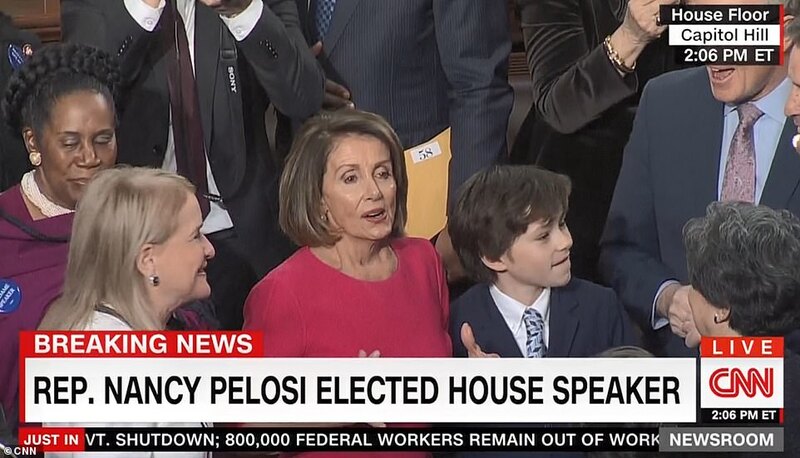 ‘Having received a majority of the votes passed, Nancy Pelosi is elected speaker of the House,’ House clerk Karen Haas announced. 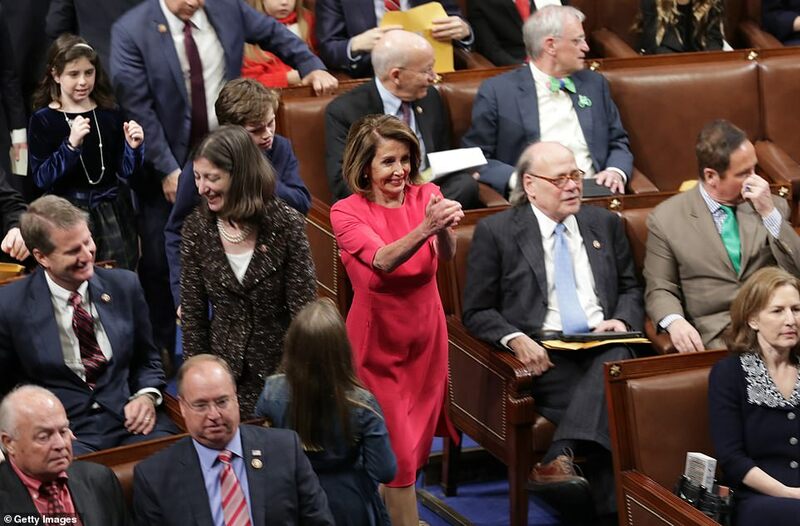 Democrats gave her a standing ovation, cheering and whopping on the House floor. 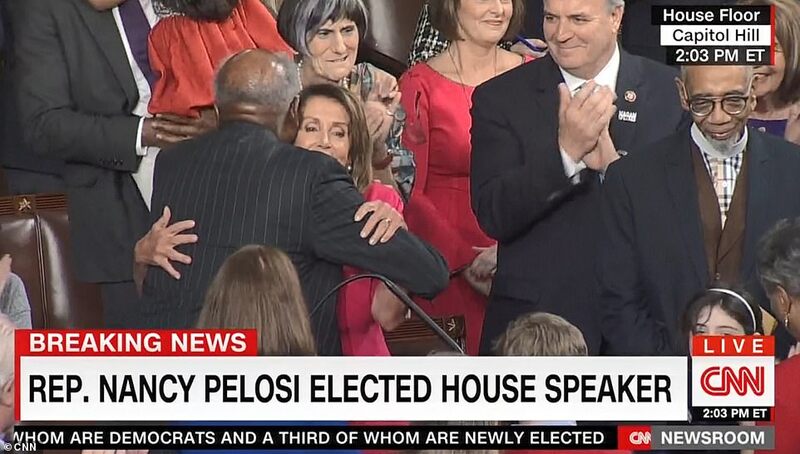 A couple of Pelosi’s grandkids ran to hug her. 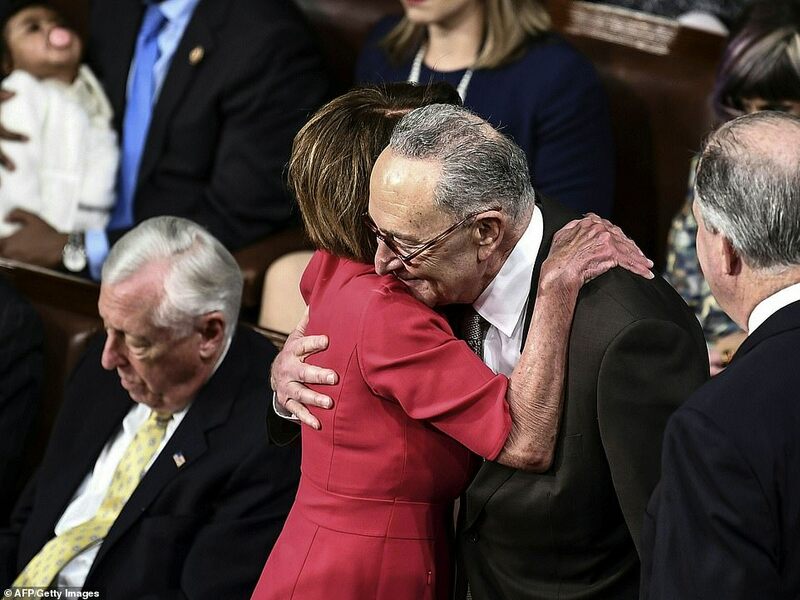 Other lawmakers gave her hugs and kissed her cheek. 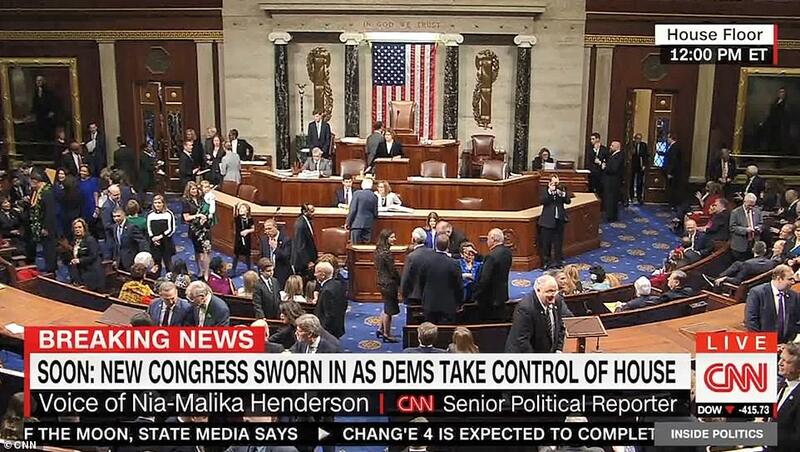 Democrats cheered her from the start of the session, which began with her nomination. 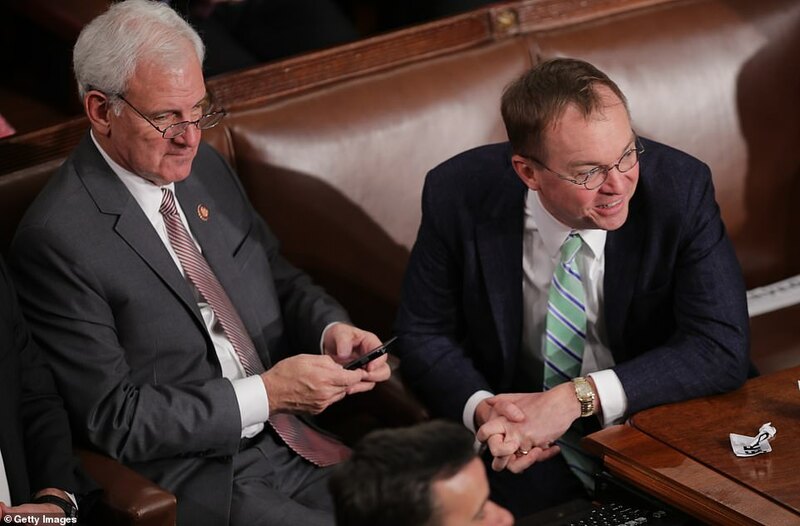 The roll call vote began shortly after 1 p.m. with the Clerk of the House calling out each member in alphabetical order. 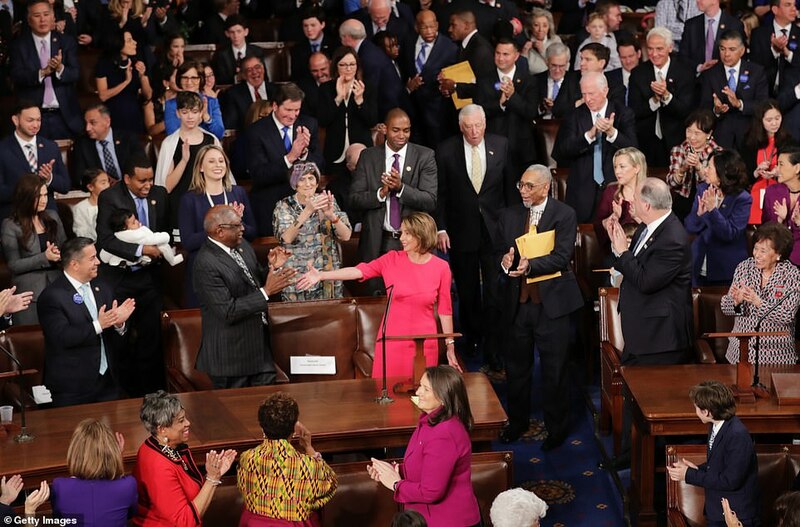 Pelosi sat on the edge of her seat at times, smiling broadly as Democrats called out her name. She would swivel her head around the room to watch as the votes racked up in her favor. 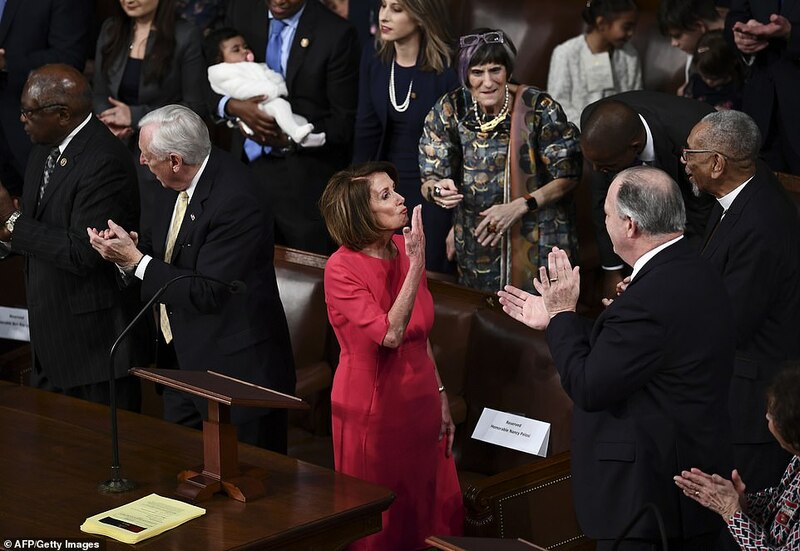 Her granddaughter Bella was on the floor with her and danced in her seat, waving her arms when Rep. Anna Eshoo voted for her grandmother. 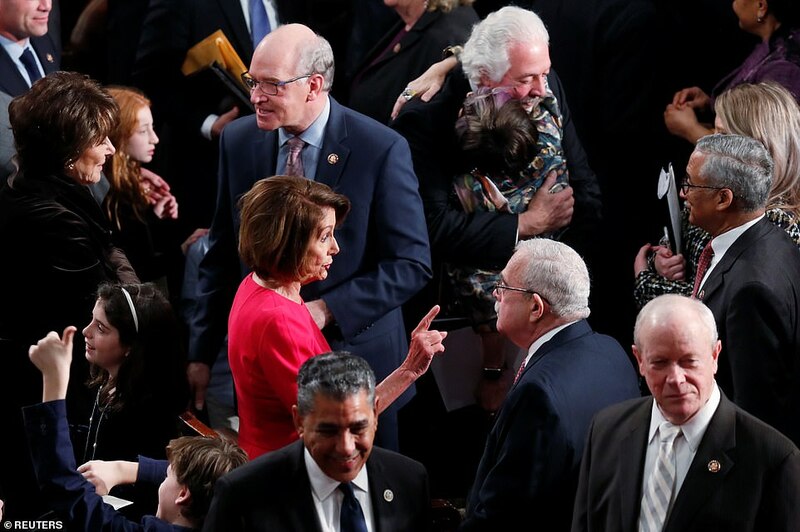 Pelosi’s grandchildren then gathered around her when it was Pelosi’s turn to cast a vote for speaker. 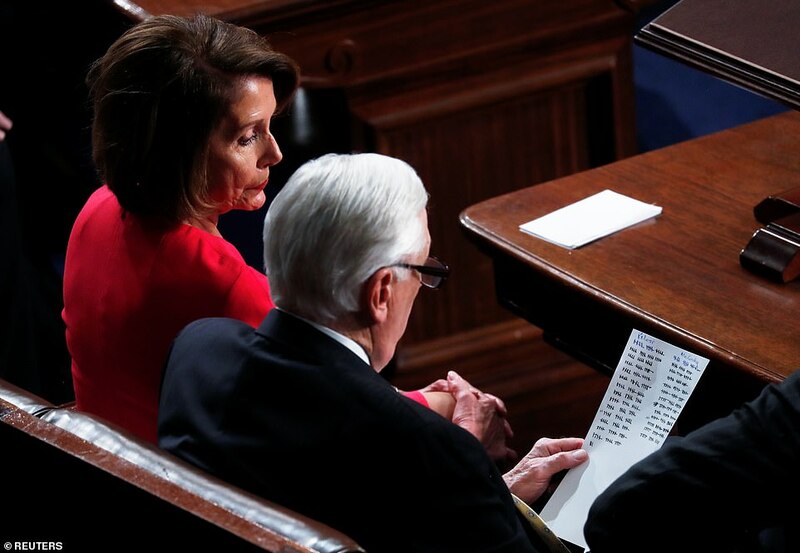 Pelosi appeared so engrossed with what was happening around her that she forgot to vote for herself. Her deputy, Steny Hoyer, nudged her to vote. Freshman Rep. Alexandria Ocasio-Cortez voted for Pelosi, as she said she would, leading to groans from the Republican side of the aisle. 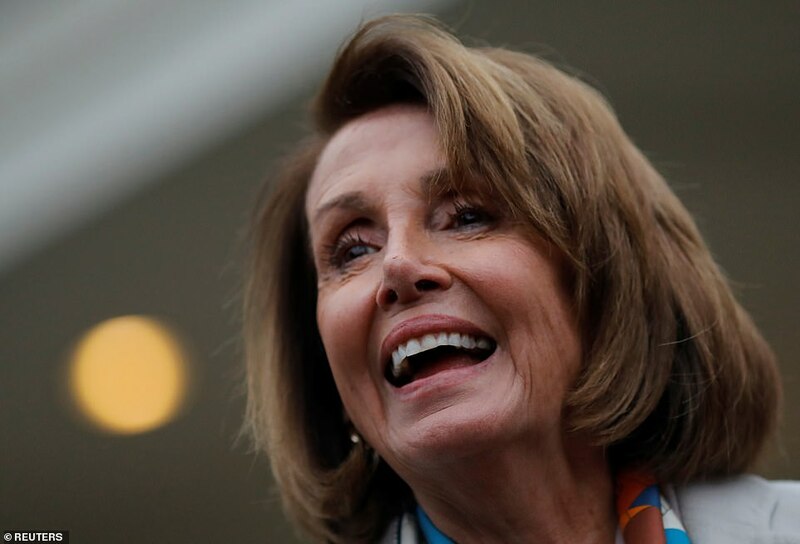 ‘I vote for the lady who will truly make America great again, Nancy Pelosi,’ said Democratic Rep. Steve Cohen. There were a few dissensions in the Democratic ranks. Rep. Anthony Brindisi voted for former Vice President Joe Biden in a protest vote. Rep. Conor Lamb voted for Democratic Rep. Joe Kennedy. Kennedy was spotted laughing when his name was called for speaker. 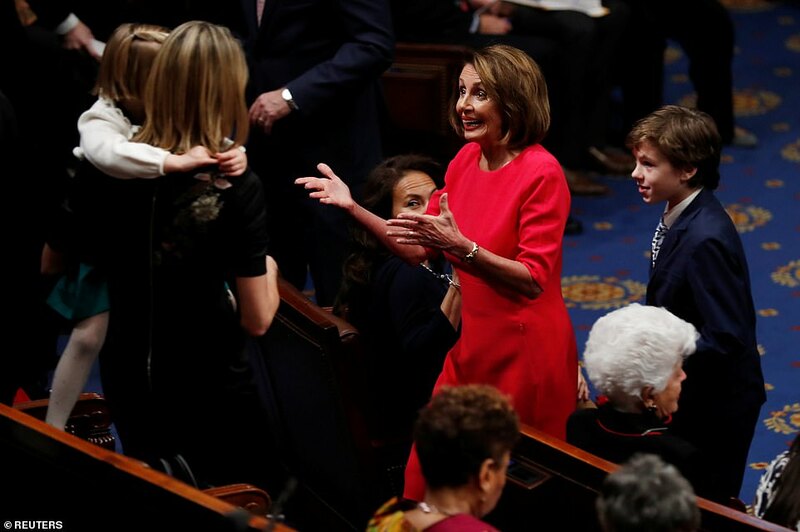 Pelosi entered the House of Representatives on Thursday with a thumbs up and followed by her grandchildren as she prepared to become the first person in more than 50 years to ascend to the speakership after losing it. 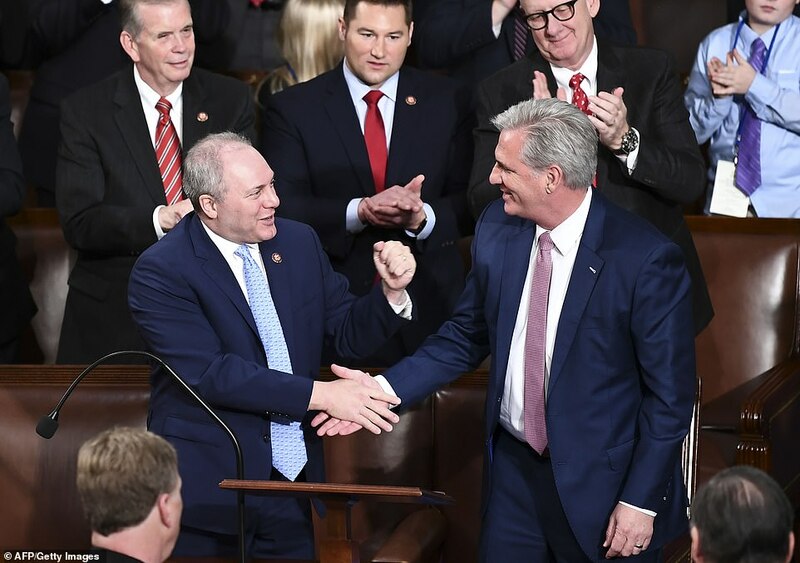 Recent speakers either quit – burned out as Republicans John Boehner and Paul Ryan were – or were forced out by infuriated members of their own party as Newt Gingrich was. 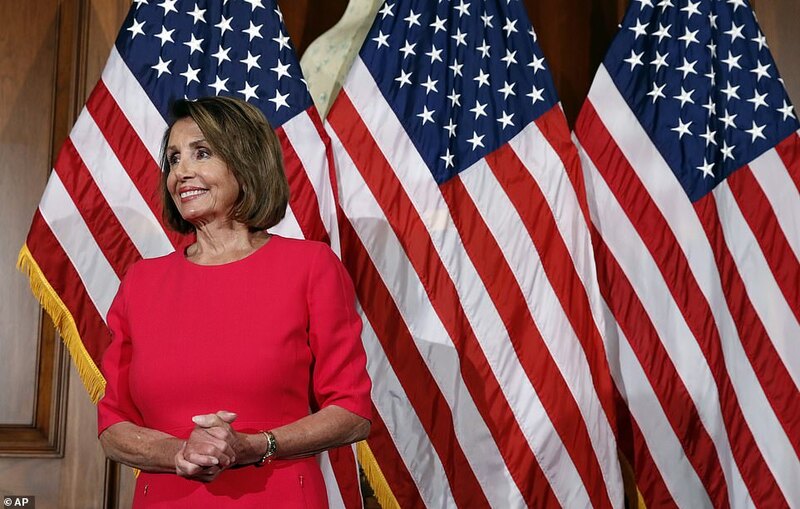 Pelosi, 78, made history in 2007 by becoming the first woman to lead the chamber. Now she returns to power as head of the Democratic Party and the second in line to the presidency after Mike Pence. 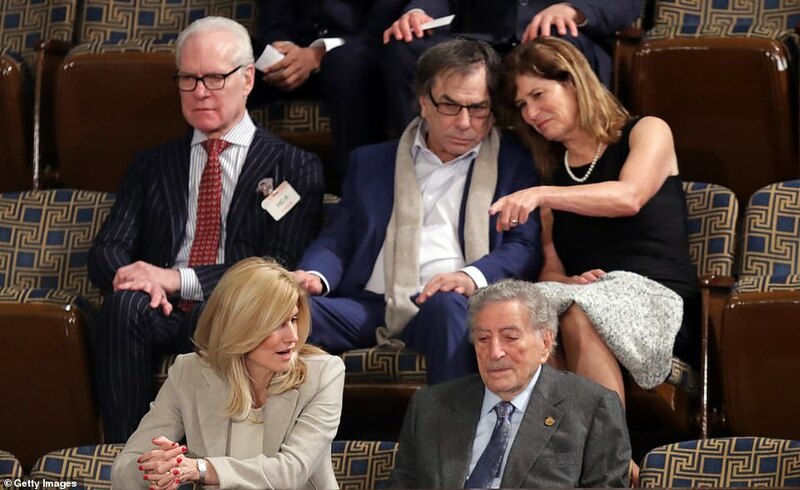 Guest of honor: Tony Bennett was in the Speaker’s box with his wife Susan to watch Nancy Pelosi getting ready to take back the gavel. 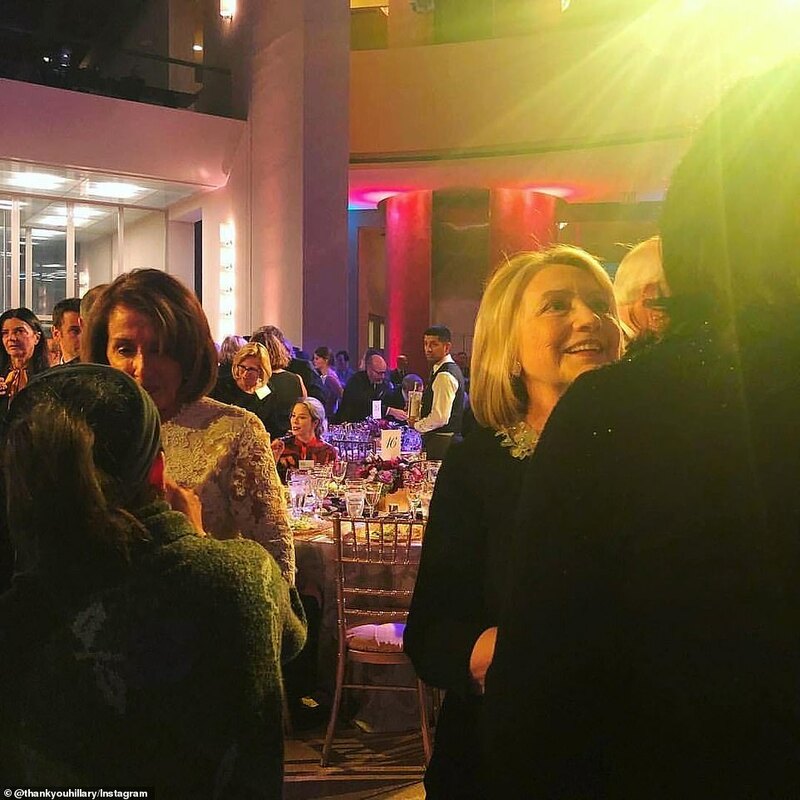 He serenaded her at a dinner on Wednesday night at the Italian embassy in Washington D.C.
She will again face a Republican president down Pennsylvania Avenue. But while she and George W. Bush had a cordial relationship, her tenure with President Donald Trump already has been marked by a shouting match in the Oval Office and a partial government shutdown. Both sides are at an impasse over funding Trump’s border wall as day 13 of the shutdown begins. 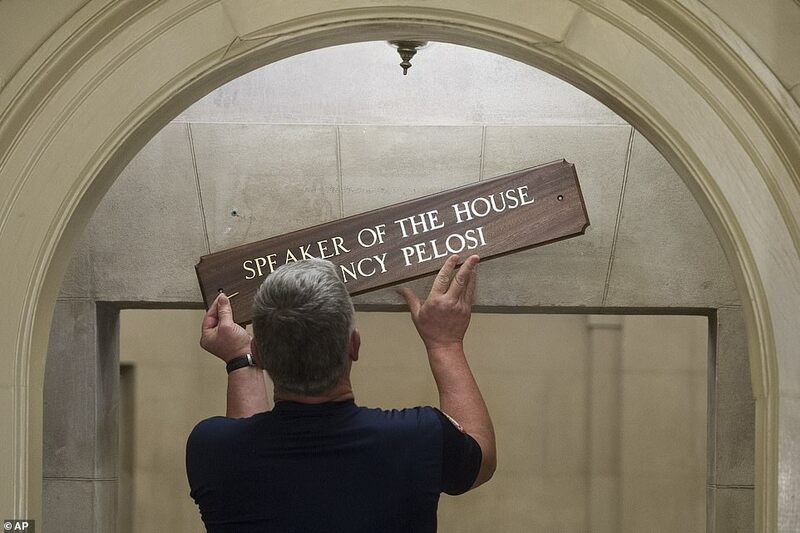 When the House of Representatives met at noon on Thursday to gavel in the 116th session of Congress, the first order of business will be to elect a speaker. The first day for new lawmakers will be long on work and short on glamour. 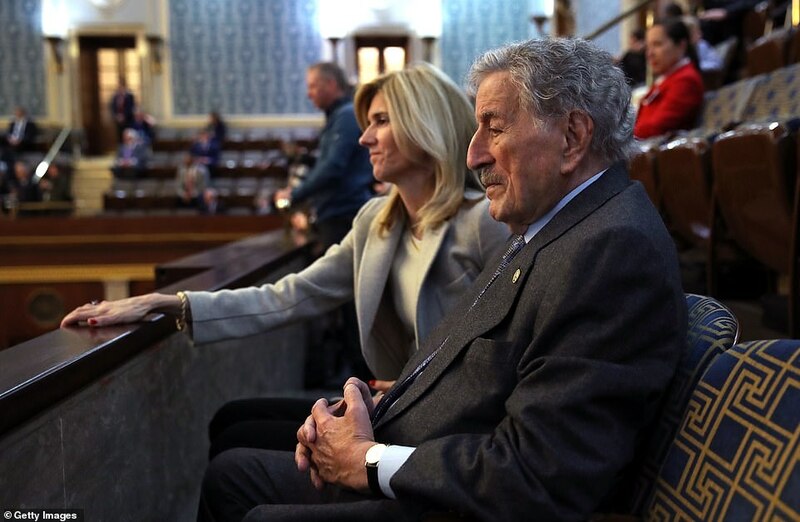 The speakership vote took about an hour – a time period members are asked to stay on the House floor. 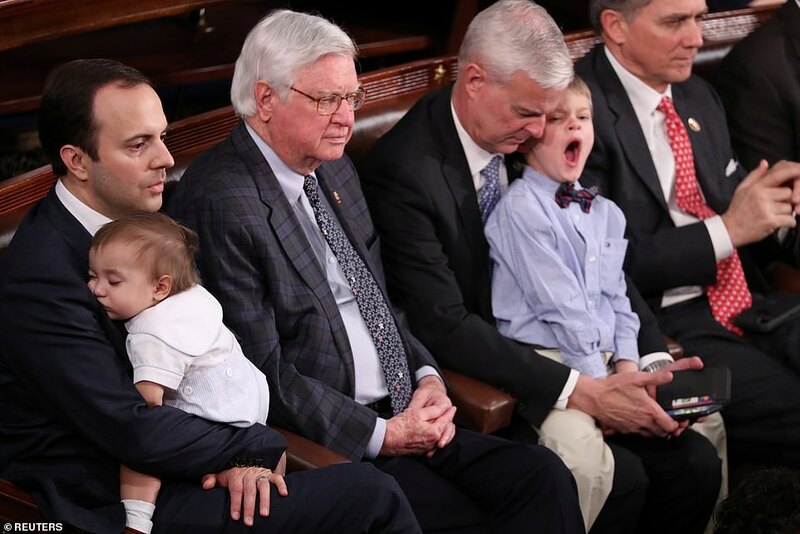 Several lawmakers brought their children to the House floor and several members held babies in their arms. The Clerk of the House called for speaker nominations. Democrats put forth Pelosi and Republicans will nominate Kevin McCarthy, who will serve as GOP minority leader in the 116th Congress. Then the House held a rare roll call vote. 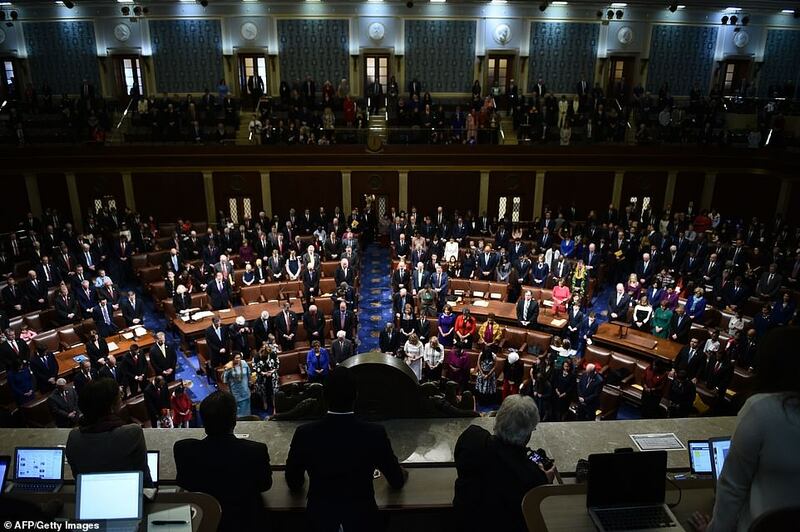 Given its size – 435 members – the House uses an electronic system to vote up or down on legislation. But the speaker’s race is one of the few occasions when the clerk calls the names of every member to let them voice their vote. Each member is called individually, in alphabetical order. Lawmakers can vote for anyone. The Constitution does not require the speaker of the House to actually be a member of the House and some lawmakers vote for an alternative. 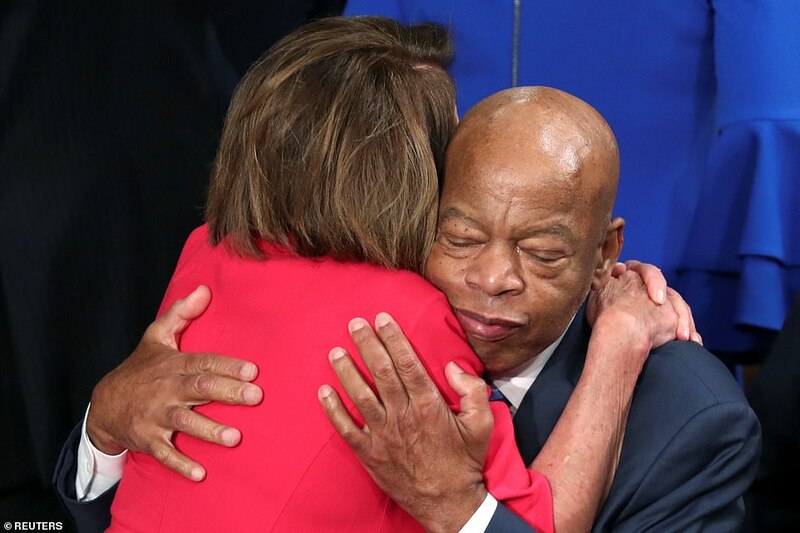 In 2017, then-Democratic Rep. Kyrsten Sinema of Arizona voted for civil rights icon and Georgia Rep. John Lewis in what was seen as a protest of Pelosi. Lawmakers also use their time to make a political point. ‘Having been told Republican input was not wanted or needed in Obamacare, I vote for Paul Ryan,’ GOP Rep. Louie Gohmert said in 2017 when he cast his vote for Ryan for speaker. ‘Because climate change is not a Chinese hoax, Nancy Pelosi,’ Democratic Rep. Jared Huffman said of his vote that same year. A majority is required for a win. In 2007, Pelosi and her team worked to make sure she had the unanimous support from Democrats to seal her historic rise as first female speaker of the chamber. 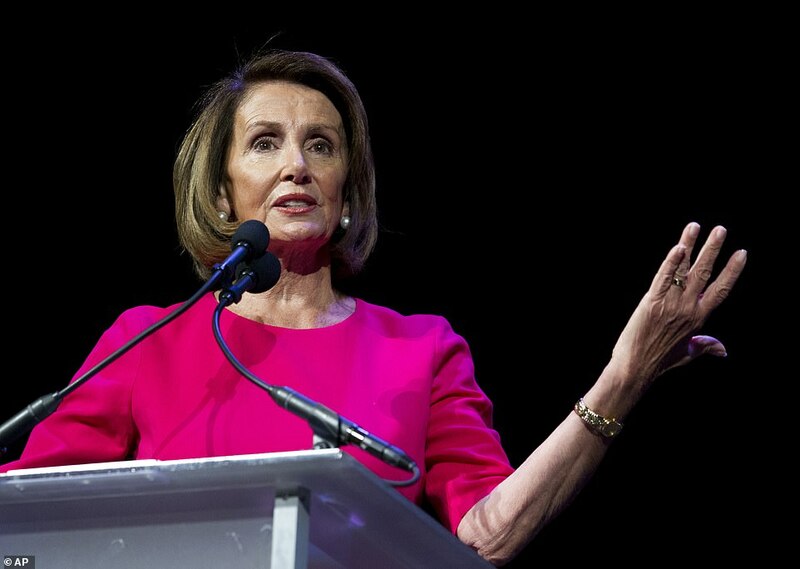 After Democrats won the chamber in the 2018 election – picking up 40 House seats – there was chatter Pelosi may not take the speakership again. But the California Democrat proved her chops as one of the best negotiators and vote counters in Congress by locking up her return to power. She cut a deal with dissident Democrats to gain the speakership but at a price – she will be out of leadership in four years. Protest votes are usually tolerated during the speaker election. Out-and-out betrayals of your party are not. In 2000, the last instance where a lawmaker voted for the other party’s speaker’s candidate, then-Democratic Rep. Jim Traficant voted for Republican Dennis Hastert for speaker. In response, the Democrats stripped him of his seniority and he lost all of his committee assignments. 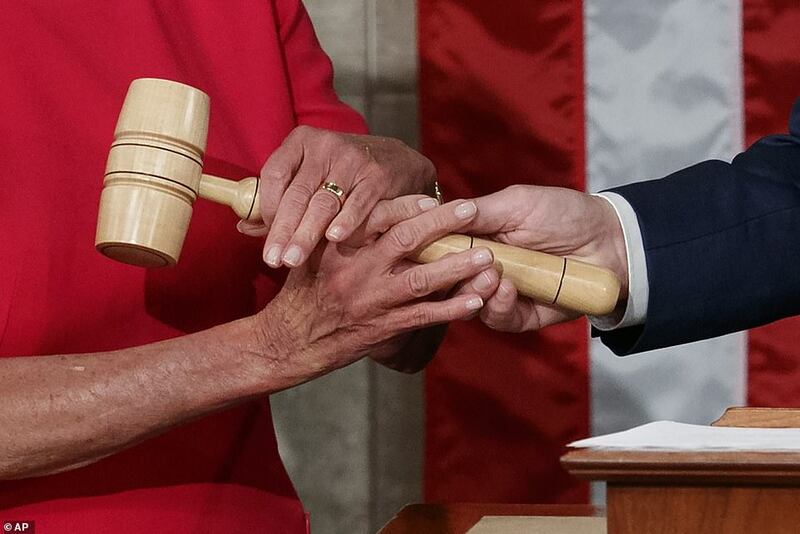 The formal vote for speaker will begin around 12:45 p.m. and is expected to end just before 2 p.m.
Once the vote for speaker is done, Pelosi was sworn in by the Dean of the House, the chamber’s longest-serving member, who is Republican Rep. Don Young of Alaska. 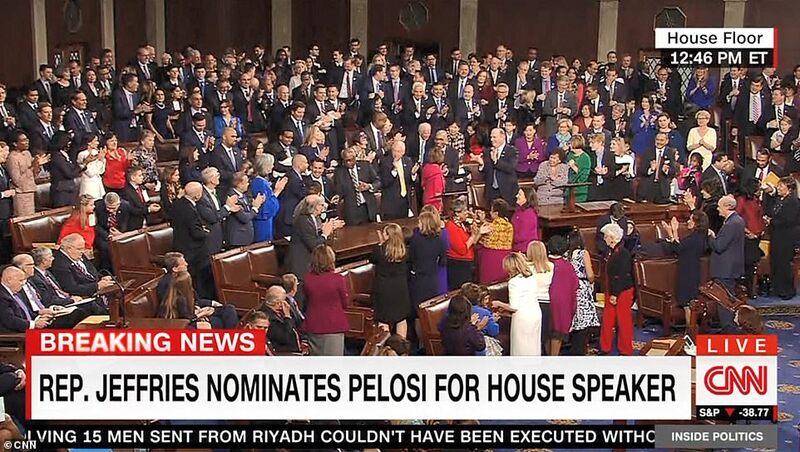 After Pelosi took the oath of office, she will address the chamber to give her vision of leadership. Then she swore in the rest of the House. 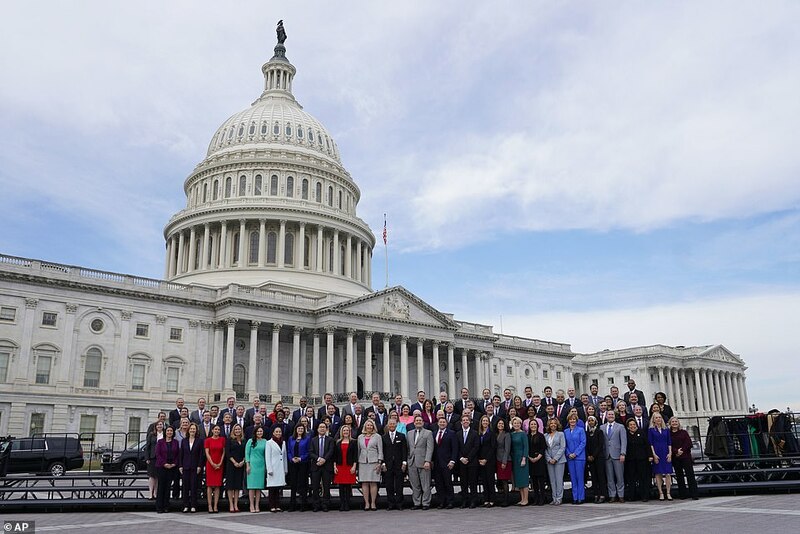 The first day of a new Congress takes on a first day of school atmosphere. Most lawmakers are dressed in their finest. Several bring their families and children are also dressed up, particularly if they want to go on the House floor. 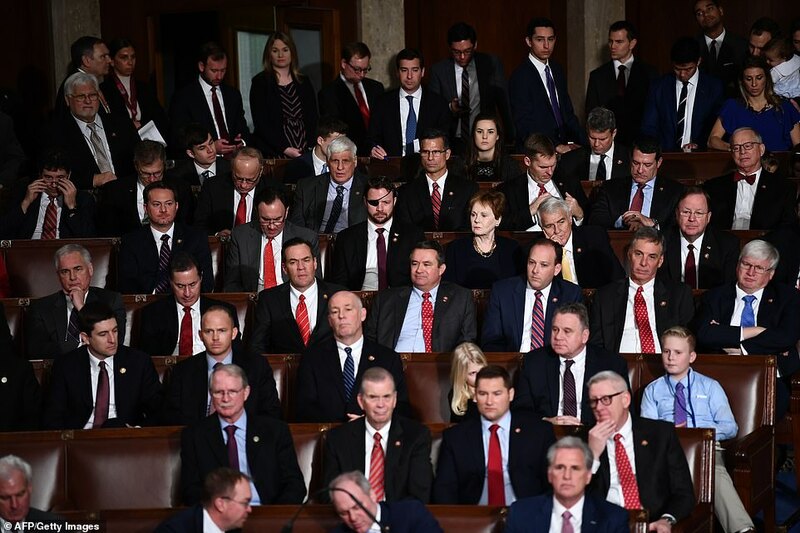 The House dress code requires men to wear a jacket and tie. 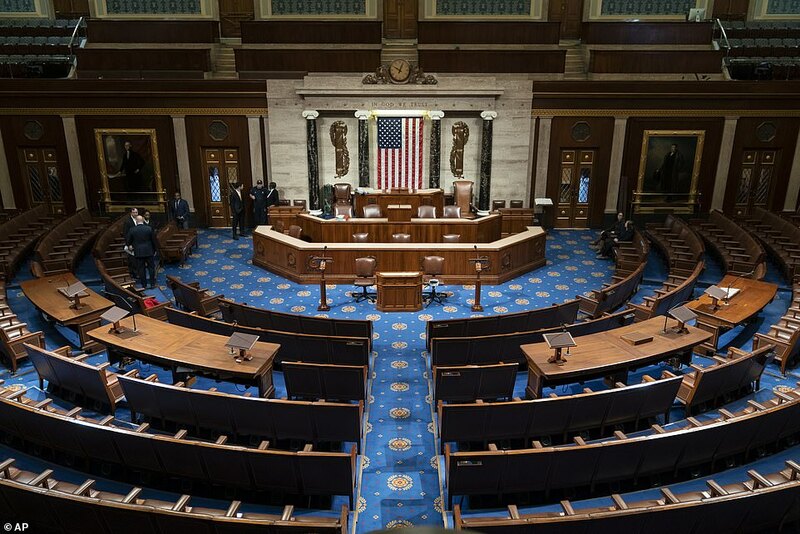 Lawmakers will be reminded there are no photos on the House floor – a rule the younger members may have trouble with. Both members and their staff wore lost looks on Thursday as they tried to figure out the labyrinth system of hallways and tunnels that make of the Capitol complex – the Capitol building itself, three House office buildings and three Senate office buildings with an underground system of tunnels connecting them all. New members received their lawmaker pin Thursday morning – the jewelry item that identifies them as a member of Congress. It allows them to bypass the metal detectors in and out of the Capitol building and surrounding House office buildings. They also received their voting card so they can use the House’s electronic voting system. Rooms in the Capitol were set up for receptions. 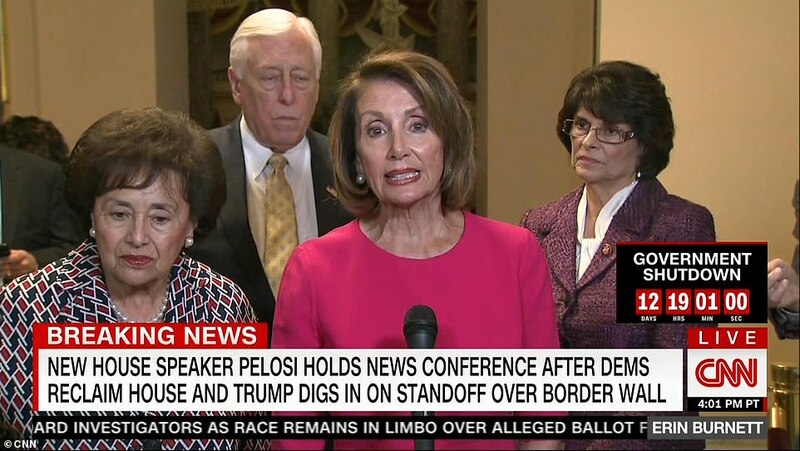 Several new members were spotted going into one basement room wearing silver ‘madame speaker’ pins in support of Pelosi. After the speaker’s vote, members will debate and vote on three measures: a rules package to govern the rules of the House and two resolutions the Democrats proposed to reopen the federal government, which is on day 13 of the partial shutdown. It will be a long first day for the new members. The last votes are expected around 9 p.m. 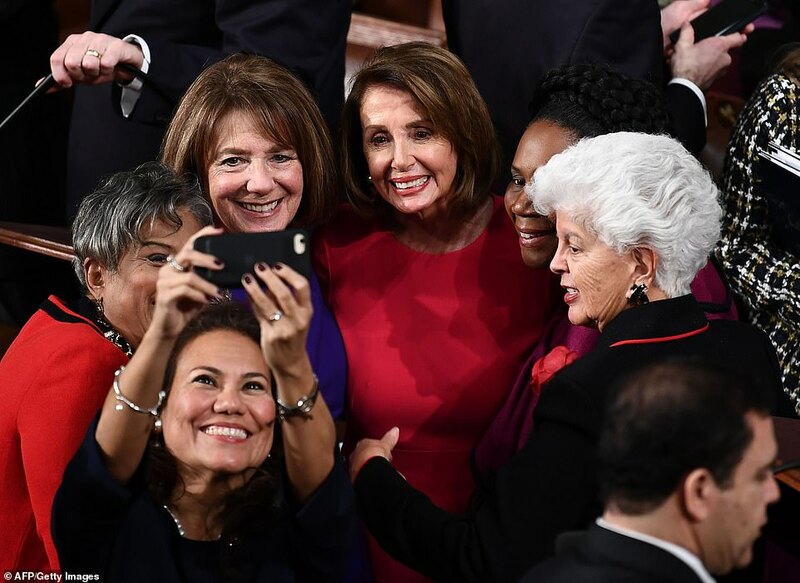 In between floor debates and voting, members and their families will be able to get their photos taken with Pelosi to commemorate the occasion.